The following tip is a super fun thing you can do with your family and the kids (and the kid in all of us) will surely love it. 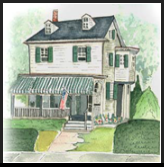 We're talking about the Vanilla Bean Creamery which features Cape May's best (and only maybe?) home made ice cream. They are only open during the summer months but when they are, we highly recommend making the trip to get some. Posted on August 16, 2013 by Michael and filed under Longfellow Recommends, Fun and tagged ice cream kids family. For Our Cape May Guests — The Longfellow Family Eggnog Recipe! Mom's old recipe file that we tap into each summer to make our great family seafood recipes, or in the winter when we want to make our famously potent Longfellow House egg nog. Funny how every family seems to have a recipe index box just like this. Here's a great tip — if yo make the egg nog, use Grolsch beer bottles that have the distinctive "swing top" caps. They seal up perfectly and the bottle makes for a great presentation if you're handing out your nog as a gift. When we make our Longfellow House eggnog, we create a custom labels for the bottles. It's not too hard to do on the computer, and it's a nice detail that people love. 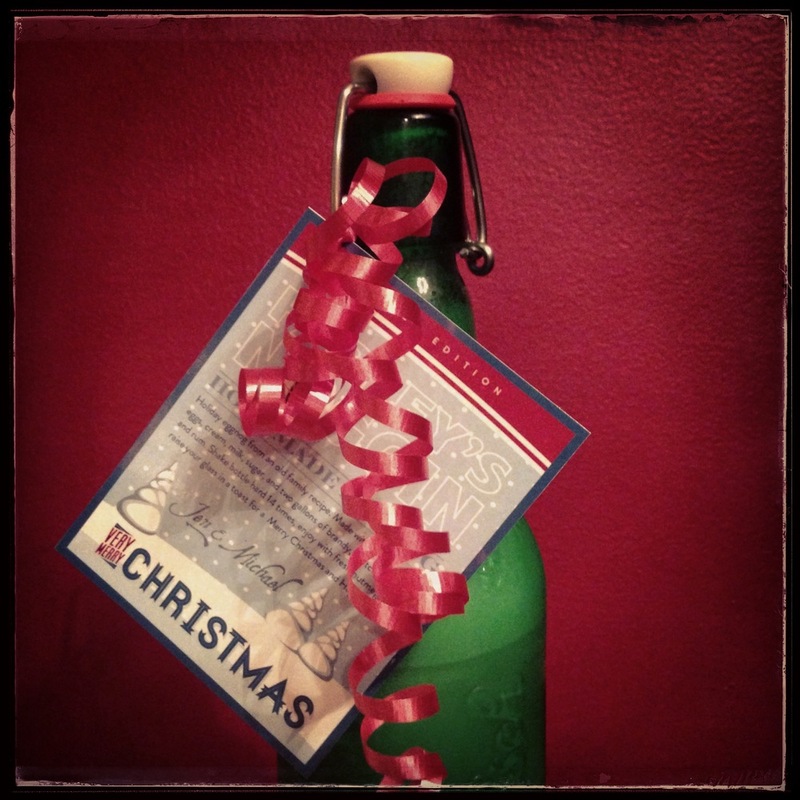 Here's the green Grolsch bottle filled with nog, and a custom label with beautiful packaging by Jen (thanks Jen!). Mom must have been tasting the samples while she wrote out the recipe (there's a couple of question marks regarding measurements). We tweaked and modified the recipe and have provided simple step by step instructions (below) so you can make your own! Here's a fun post. Every year we mix up a batch of our Longfellow family eggnog around the holidays. We use an old family recipe that's really quite strong, and we give it out to friends and family to celebrate the holiday season. Sometimes we'll create unique labels to make it a fun gift to receive, and each year we get strong requests to make it again. We have a few fans in town that have become lovers of this classic holiday tradition, and we hope that by posting this recipe — others can share in the festivities! Just be careful, as our grandmother use to say — this nog shizzle's got some dope power. The recipe came from our mother's side of the family and was handed down to her from my grandfather. It's a simple recipe but also a classic, and over the years we've added our distinct touches to get the nog to taste just the way we like it. We're posting the recipe so that you can make your own if you choose. It's really a fun process and though you might not want to let your kids drink it (at least not with alcohol they can certainly help in the making of it and the packaging, which can be a fun afternoon together. Separate eggs (the egg yellows from the whites) – and beat the yellows into thick batter in a large bowl. Pour in half the sugar and keep mixing well until it's a nice and thick consistency. Transfer to a large pot and slowly add liquor – beating all the time. Then add the Cream, Milk, and vanilla extract. Add the rest of the sugar. One trick is to whip up some of the cream separately (a cup or so) until it's almost whipped cream, and then add to the mixture. This helps create a really nice thick and creamy texture. Some recipes suggest beating the egg whites and adding in, but we find it's much tastier using cream for the same thickening effect. Once the mixture is complete, you'll need to set up a pouring station with some kind of measuring cup and funnel to pour into the bottles. Here's another secret — you want to make the eggnog in advance of when you'll drink it. If it stays in the fridge for a week or two, the flavors really start to blend together and it takes on quite a smooth taste even though there's tons of liquor (which helps make the use of raw eggs safe). When serving, you'll need to shake the bottle vigorously about 14 times to clear the thick cream at the top of the bottle. And we suggest you serve in nice glasses and grate some fresh nutmeg on top. We hope you enjoy the recipe and let us know if you have any questions or would like to share your experience. Happy holidays! Posted on December 31, 2012 by Michael Longfellow and filed under Longfellow Recommends.